Mention yellow and you probably think first of bright, crayon yellow. Think orange and you get, well, an orange. Because these youthful, high-impact colors have such strong emotional appeal, you might be concerned they lack sophistication or carry too much intensity for home decor. But this pair, nestled right next to each other on the color wheel, is actually full of decorating possibilities. Their varied shades and tones blend beautifully with each other, and they’re wonderful when paired with their opposites on the color wheel … oranges with blue hues, yellows with a variety of violets. There’s no question yellow and orange add life to bland or safe color schemes. Just one lemon or tangerine accent – whether a single painted wall, modern chair, or decorator pillow – adds zest to a room. 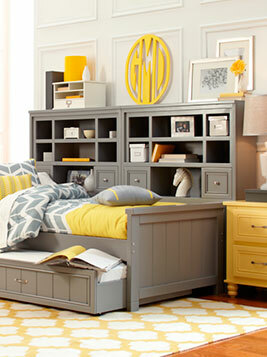 But you don’t have to go to extremes to enjoy the sunny, natural appeal of these two colors. 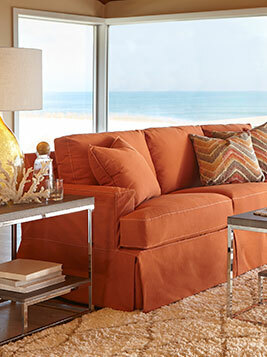 Other yellow-to-orange hues offer sustenance and richness in softer, subtler palettes. Mustard, butter, custard … gold, apricot, saffron … peach, salmon, pumpkin … terra cotta, coral, shrimp. If you aren’t drooling by now, you’re definitely reading the wrong page. 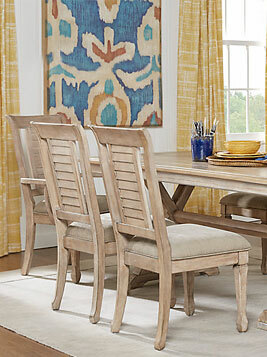 These are such delicious colors with so many design possibilities, it would be a pity to exclude them from your home. What follows is a list of possible palettes to jog your own color creativity. Southwestern Style: Terra cotta and other clay tones mix beautifully with creamy yellow, sage, teal, and forest green; turquoise or deep blues with a purple cast, and soft purples. Think Grand Canyon, desert sunsets and adobe walls. Breezy Tropical Tones: These special pastels include banana, cantaloupe, coral, and the whole rainbow of sherbet tones and summery colors like daiquiri and aquamarine. Bring on the umbrella drinks. American and European Country: Mustard and mellow gold recall historical rustic color schemes that coordinate wonderfully with milk paint tones of blue, green, oxblood, and barn red. Beige, brown, and black are great accent colors in this scheme. Summery Cottage Style: Lots of white is the cool and unifying element for color schemes including buttercup yellow, Delft, or pillow ticking blue, and celadon or the simple dark green of old fashioned shutters and lawn furniture. Gen X Brights: After years of wearing nothing but black, this color-deprived group is all about the uncompromising colors of commercial products: iMac tangerine, HoJo rooftop orange, Powerpuff Girls pastels, and Highlighter yellow are all part of the fun. Adirondack Autumn: Lodge style’s exposed wood beams and river rock fireplaces play beautifully off harvest colors like cider, pumpkin, and russet or fall foliage yellows and oranges. Spruce, hunter green, soft sage, and blue-to-purple grape tones provide the contrast. Arts&Crafts/Mission: From the golden glow of mica lampshades and Tiffany lamps to the copper accents on simple oak furniture, this look basks in the warmest tones of yellow and orange. Tapestry and celedon greens are perfect complements to the rich creams, mustards, and browns so associated with this popular decorative era. Old World Warmth: Mexican, South American, and Mediterranean homes glow with colorful, sun-warmed exteriors. Terra cotta, umber, sienna, persimmon, gold, and warm yellows are everywhere, complemented by doors and shutters in striking shades of blue and green, the chalky patina of age and brilliant flowers everywhere. Sophisticated Pastels: It all depends on your idea of sophistication of course, but the combination of salmon, gray, and taupe comes to mind – as does a floral palette including palest peach, chiffon yellow, lilac, and petal pink. Faux Finishes: If you’re a fan of sponged, ragged, marbled, or combed surfaces, combine a gold or rich cream base with a top layer of salmon, terra cotta, or other mid-range orange tones for extremely warm and sophisticated wall treatments. With such a wide range of tones and possibilities, it’s hard to remain convinced that yellow and orange are too simple, intense or unflattering for your home.